Gertrude I. Lobenstein, age 96 passed away on Saturday, April 6, 2018 at Sylvan Crossings in Waunakee. She was born on Febraury 2, 1923 in Monroe and was the daughter of Louis and Lela (Seflow) Birkholz. She married Clarence Lobenstein on Feb., 26, 1942 in Wisconsin Dells. 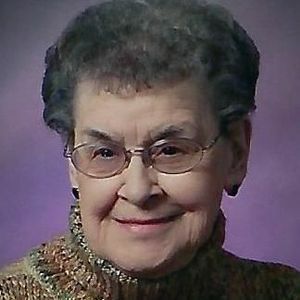 Gert was a charter member of Our Savior's Lutheran Church with her husband. She served as American Legion Auxillary President for 3 years and also volunteered at the V.A. Hospital. She is survived by a daughter Karen Munson of Westport, a son Mark of Jonesboro, Arkansas, four grandchildren Robin (Rick Short) Reynolds of Ridgeway, Richard C. Munson of DeForest, David and Nicole Lobenstein; 4 great grandchildren Matthew Reynolds, Brook Meudt, Jake and Sam Munson, 2 great great grandchildren Isaac and Sidney Meudt; sister Bernice Faltersack of Sun Prairie and many nieces and nephews. Funeral Services will be held at 11:00 a.m. on Tuesday, April 9, 2019 at the Tuschen-Newcomer Funeral Home, 302 Columbus Street in Sun Prairie with Pastor Gerry Kuhnke presiding. A visitation will be held from 9:00 a.m. until the time of service at the funeral home on Tuesday.